Israel’s Water Authority shut off the Shiloh pipeline, saying illegal Palestinian drilling is wreaking havoc on the supply. Now everyone is suffering. To celebrate World Water Day on March 22, ISRAEL21c takes a look at 10 water innovation projects bringing clean water to communities across the world. Epic CleanTec took an Israeli technology for clean, odor-free disposal of dog waste and is applying it to high-rise buildings, starting in San Francisco. 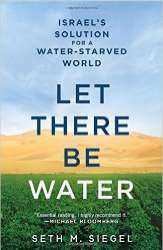 Israel now gets 55 percent of its domestic water from desalination, and that has helped to turn one of the world’s driest countries into the unlikeliest of water giants. The country faces a previously unfathomable question: What to do with its extra water? Hamas paper finds excessive digging of wells and pumping in Gush Katif lands evacuated in 2005 causing resource collapse. The Israeli company Netafim has developed an irrigation system that can grow plants with much less water, which has proven to be a good line of business amid increasing drought. 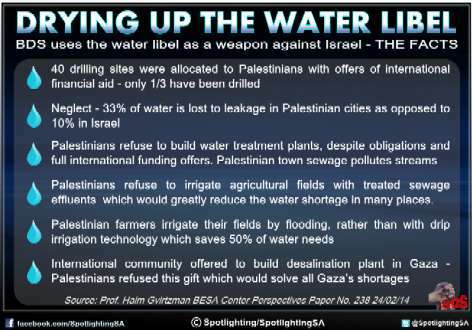 “Water Apartheid” is one of the BDS libels against Israel.